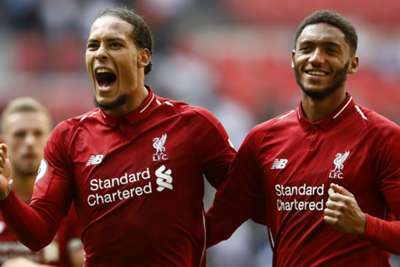 Liverpool's significant defensive improvement has been no accident after hard work on the training pitch, according to defender Joe Gomez. Ever since Jurgen Klopp took over as Liverpool manager in 2015, the Reds have rarely struggled to find the net. But they have often attracted criticism for their performances defensively, with pundits suggesting they would have gone much closer to winning the Premier League title in the last two years – instead of consecutive fourth-placed finishes – had they been more solid at the back. Last term they conceded 38, giving them the fourth stingiest defensive in the league, but Liverpool still shipped 11 more goals than champions Manchester City. Following Saturday's 1-0 win at Huddersfield Town, Liverpool have let in just three goals in nine league games – the same amount as City – and Gomez feels that comes down to the work in training. "We have worked a lot in training on being defensively sound as a unit and it's paying off," Gomez told the Liverpool Echo. "That's what we want – keeping clean sheets. It helps that in terms of the defence we've all been here since last season. "We have played quite a lot of games together now. There hasn't been a new addition to the back four this season. "It's about communication and knowing each other's game. There's a good understanding back there but it's just a good start. "This is the foundation for the season ahead. There's a long way to go. We have to carry it on and keep that habit. "It's been a real team effort - it's not just about the back four, it's about how the whole team defend. We do it altogether. "There's a real desire and attitude to stop teams scoring and that runs right through the team. "It starts from the front. If they break the first line, our boys do so well to block passes. That helps us as a back four and puts us under less pressure so when we do have to defend it's not like we've been having to do it for the whole game."